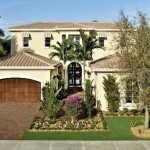 Even though the typically slower summer season is upon us, sales continue to be sizzling hot in Old Palm Golf Club. The most recent sale in our Golf Estates is Courchene Development Corporationâs magnificent Chesterfield model. At 5,060 square feet, itâs one of the neighborhoodâs most expansive homes, as residences within the Golf Estates usually range from 3,000 to 5,000 square feet. Every inch of the Chesterfield is ingeniously designed. The first floor is devoted to the sprawling Master Bedroom suite, a second bedroom, three full and two half baths, and all the main living areas, which include a spacious family room off the open kitchen, a formal dining room, and a living room. The second floor, which is accessible by elevator or stairs, contains two wonderfully private bedrooms, two full baths, and a loft. Step inside the Chesterfield and the sense of grandeur is immediate. The view from the foyer, across the living room, reveals a unique water feature with river rock in the foreground and a lovely swimming pool beyond. The home also overlooks the third green of Old Palmâs spectacular Raymond Floyd-designed golf course. Although this Chesterfield model home was recently sold, the model can be built on any quarter-acre home site in the Golf Estates. That includes the newly released, extremely private home sites that border a heavily wooded preserve of native pines and palms.Â Other new homes in Old Palm are available from $1,315,000 to $12,000,000.